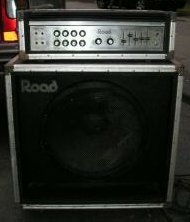 These two series (three actually) are closely linked, the first R models representing an evolution from the TR series after the acquisition of Road Amplifiers. The following RG/RB series, under a renewed enclosure design, used an interesting concept of separated pre-amp/power amp circuits. 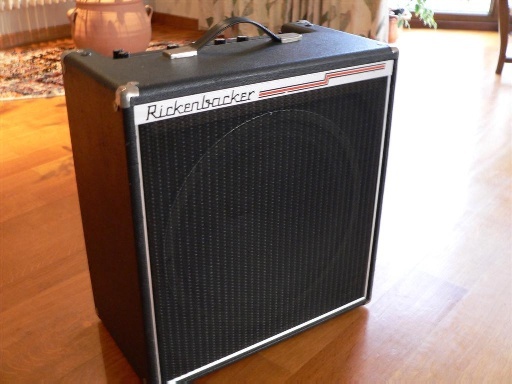 Rickenbacker seems to have mastered the oft-decried solid state technology to the point where everybody agrees on these amplifiers' sonic qualities. 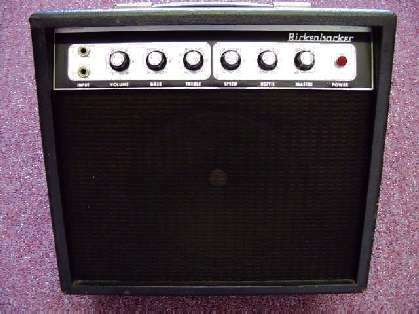 This is certainly the most popular Rickenbacker amplifier, followed by the M-8. You can always find one on eBay. A small, no-nonsense harp or practice amp. The TR7 was made from 1977 to 1984. It contained a single 10" speaker. It was a solid state amplifier, with a 7 Watts RMS rating, but it was designed with special "bounce-back" power supply, like a strobe, which made it sound more like a 25 watt amp. Features included tremolo and distortion circuits. Part of the TR Series, the TR7 was replaced by the R7 when the line was restyled. There was an RG7 which is a later, upgrade version of the TR7. Made around 1983. 2 channels with earphone jack on the right side, volume-bass-mid-treble-reverb and distort knobs, 10" Eminence speaker, reverb/distort footswitch jack inside back, 24 watts max. 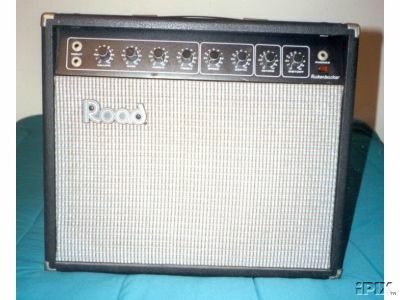 The proud owner of this TR50 wrote: "I've owned this amp for many years and love it... This amp has a great sound for a solid-state amp; it sounds even better now that I'm using the 4003 through it." Designed in 1977, these amps featured a stereo input allowing to plug a stereo cord coming directly from a 4001 bass, for instance, without the need for a Rick-o-Sound splitting box. 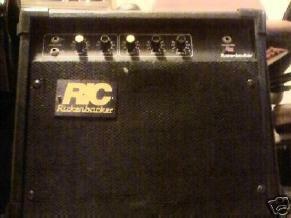 Like a lot of other solid state Rickenbacker amplifiers, the schematic can be found on RIC's site. The concept of the RB60 was similar. 100 watts, two 12" speakers. Peculiar knobs, unlike any other on Rickenbacker amplifiers: they must have been changed. 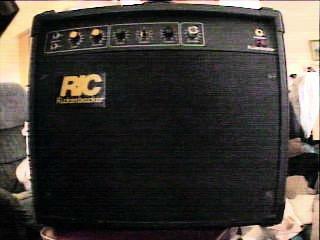 The first two TR120B amps were hand built by George Cole and myself in July or August, 1981 for what it's worth. Production started about November 1981. I don't know when the production run ended however...I left before that. The R25 had a 17" H x 20" W x 8 ½" D enclosure, and weighed about 30 lbs. On the front panel are two input jacks and one headphone jack (all ¼"), lighted on/off rocker switch, and 8 control knobs: volume, bass, middle, treble, speed, depth, reverb, distortion. In the back are two ¼" jacks: one for a tremolo - reverb footswitch, and one for ext. speaker. In the cabinet is one 12" speaker. Effects Return/Send, Reverb, Bass and Treble knobs - Select, 1 and 2 Inputs - Overdrive knob - Bass, Sustain, Treble and Volume knobs, Power light and switch. What can't be seen on the picture is the serial number, which is YN 003778: this amplifier has been manufactured in February of 1985.
off the top of my head I'd say 86-87. They're fairly rare as they weren't made in any large quantity. The stock speaker was made by Eminence and was designed especially for that amp. Introduced in 1984, the R160 with solid state circuitry featured 160 watts RMS output into 4 x 10" speakers, reverb, channel switching, effects loop, overdrive, and presence control. 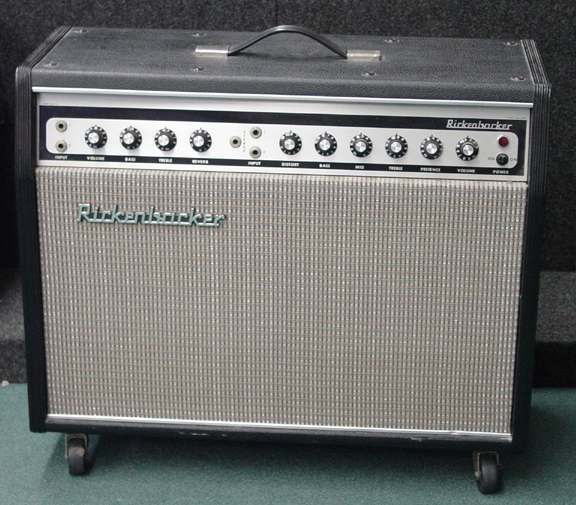 This was one of the first Rickenbacker-designed units after Rickenbacker acquired Road(which the Corporation sold years later to Celestion of England). 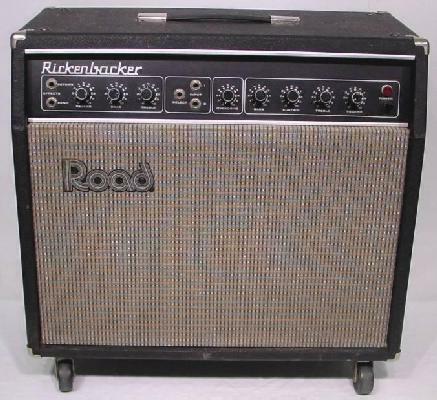 Essentially it had Rickenbacker's rather leading edge electronics, in Road's rather distinctive clothing. It had the heavy duty aluminum road case edge trim and steel corners. The suggested retail of this amplifier in 1984 was $539US. My amp has two 12"inch 8ohm ROAD brand speakers all packaged in a combo setup. Apart from the new enclosure design, you will notice that the RG7, RG15, RG30 and RG60 all share the same preamp circuitry, which is interesting-industrially speaking-because of the economies of scale. The schematics for the preamplifier and the power amplifier sections are on the company's site. These amps are fairly rare... Most of them appear with some of their yellowish knob caps missing. Introduced in 1989, these shared the same preamp design and layout. 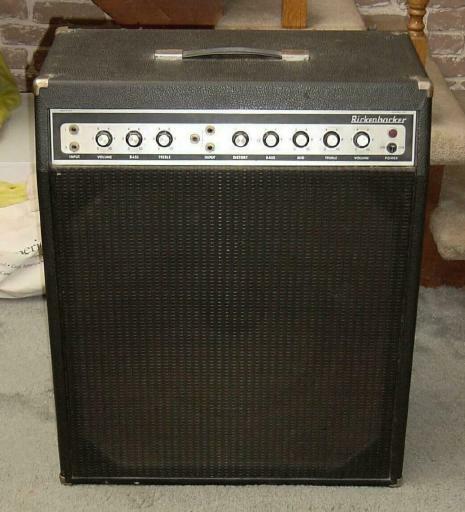 The TR50 and the RB60 were both self contained 'combo' style bass amplifiers with a single 15 inch speaker in a sealed cabinet. The RB60 has two inputs into a single preamp, however it boasts the addition of preamp/out, power amp/in jacks. It's the one you see on RIC's Schematics page, one of the last models built in 1988/89, just before John Hall pulled the plug on Rickenbacker's amplifier operations. The preamplifier was the same on the RG90. This site is in no way associated with Rickenbacker International Corporation. Rickenbacker®, RIC, and logos are trademarks of Rickenbacker International Corp.